Multi-award-winning singer and songwriter Seal swiftly rose to prominence in 1990 with the number one hit single Killer, closely followed by his eponymous first solo album. The title of this, his tenth studio album, gives us a clue that it's a significant departure from the genres of pop, soul and dance music for which he has been hitherto known. He has chosen an interesting mix of popular songs from the 1930s through to the '60s, and they're performed by a 65-piece jazz orchestra which includes such session luminaries as Randy Waldman, Greg Fields and veteran bassist Chuck Berghofer. All arrangements are by German-born Chris Walden who also conducted the orchestral sessions, which were recorded at the Capitol Studios in Los Angeles. However, there are no studio fades, which gives the listener the impression almost of a live performance; certainly not the kind of piecemeal production that is usually employed on a studio album by someone who is ostensibly a pop musician. Seal's poised colla voce opening to Luck Be A Lady gives a stylistic nod to Tony Bennett before bursting into tempo with rambunctious unison horns soaring over the big band brass. The full richness of the ensemble is revealed when strings make their entrance and by the end of this exuberant opener we're left in no doubt as to Seal's ability to deliver this kind of music. The next song, Autumn Leaves, is altogether different, sombre and reflective, with Seal's poignant vocal underpinned by the luscious orchestral arrangement. Seal's soulful tribute to the Nina Simone version of I Put A Spell On You is subtly accompanied by a gospel chorus and given a jazz flavour by German trumpet star Till Br önner. By contrast, there follows a Count Basie-style interpretation of They Can't Take That Away From Me which is the personification of laid-back swing. Seal's cover version of the 1964 single by blues singer Irma Thomas, Anyone Who Knows What Love Is, is compelling and once again features the gospel chorus. Cole Porter's controversial Love For Sale begins as a lilting bossa nova and the strings soar on a line reminiscent of John Barry's main title for the film You Only Live Twice before the orchestra breaks into swing for the bridge before returning to the latin feel. The Rodgers and Hart classic, My Funny Valentine, is rooted by Berghofer's rich bass, and Seal's performance is intriguingly reminiscent of soloist Br önner's own vocal styling although Brönner is only to be heard on trumpet on this album. One might expect I've Got You Under My Skin to pay homage to Riddle's classic arrangement for Sinatra, but Seal's version is pleasingly different; a more contemporary big band affair. Charlie Chaplin's 1936 composition Smile became a hit for Nat 'King' Cole in 1956 when lyrics were added, and Seal's interpretation of the suppressed melancholy of the words is matched by the equally beautiful orchestral arrangement. The tone lightens for the walking groove of Beginning To See The Light when Seal is accompanied by the vocal velvet that is The Puppini Sisters and the mellifluous trombone of Alex Iles. Numerous singers have recorded It Was A Very Good Year since it was made Famous by Sinatra in 1966 and Seal's rendition is a wistful end to the standard edition of the album. 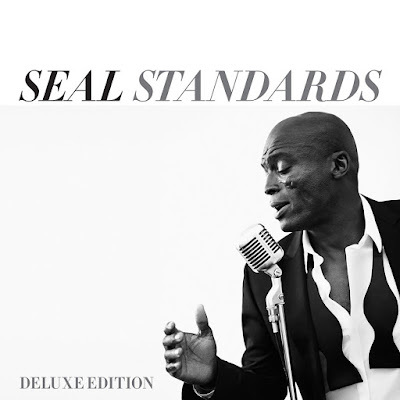 The deluxe edition, however, contains three further tracks, the first of which, The Nearness Of You, Seal sings with aplomb, accompanied by a beautifully sympathetic string arrangement. The next two are seasonal, perhaps with the album's November release date in mind: an almost cheeky version of Let It Snow and Mel Torme's classic composition The Christmas Song, which really is the icing on the cake as while Seal clearly has Nat 'King' Cole's seminal version in mind, he and arranger Walden make it their own. Many have tackled the Great American Songbook, and Seal said of this album “Recording these timeless tunes was a lifelong dream”. While for other artists one might argue that such projects might best have remained a dream, I believe that Standards is a laudable realisation of Seal's ambition and he may well need to make room for another award or two.